I’ve listened to your 1st 2 albums. Amazing!! My wife is a new fan by the way. I am anxiously awaiting Amain, your 3rd release on August 25th. From what I’ve read, we can expect a very elaborate sophisticated outing. What do you want everyone to know about the new album? Thanks for your kind words! Our new album is called AMAIN. It means with full force, with full speed… for us it means, we gave all we got. It is our biggest and the best album in every single way. I would say that if the listener is up for an audio-visual journey with an open mind and healthy attitude, this album is definitely for that person. For the uninitiated, how would you describe your music? We have always had some hard time coming up with good descriptions or genre definitions. It is definitely symphonic and visual, music of extreme contrasts, soundtrack for feats epic and deeds whispered in shadows. Combining beauty with brutality. Lot of layers but always with a destination. It has been 6 years since the last album. What is different in the band? What has been the most challenging issue for you? The heart and soul of our music are still the same. But instead of just copying our previous songs we have found new and better ways to express the emotions and stories. We all have grown, not only physically, but also mentally, musically and professionally. Everything we do today sounds more professional than on the previous albums. The ideas that would have been released few years ago, were not good enough for AMAIN anymore. The biggest challenge was definitely the lack of support. Promotional or financial. We lost our previous record label when we were already working on these songs and without anyone to support us we also lost our motivation. But the music and the songs kept us going. We wanted to release one more album by giving everything we go…. and I mean everything. It took almost 3 years just to record and mix the album plus huge pile of our own money. You’ve been through a few line-up changes. Is the current line-up permanent? I ask because each member brings new influences and can alter the overall sound. Yes, we went through some changes in the past years, but our line-up is now back in its original form, with its old members. And you are absolutely right, new members bring new influences for sure. But when we started to work together again, it became evident that you simply can’t make Crimfall music without right people. We have been together about 10 years now, done lots of shows, made 2 albums before AMAIN, so there is a strong connection between us that is as important thing as playing or composing itself. There are many metal bands from Finland. How do you ensure that you stand apart from them…and from other bands in general? You can get lost also by trying to stubbornly stay away from beaten paths. There are certain parts that sound very Finnish or are not completely unique but we like to think the combination itself is something special. Also the scene in Finland is quite tight and small so we end up cooperating with many bands, sharing tips and feedback. And some influences are bound to flow back and forth. I understand Jakke writes the music, Mikko writes the lyrics and then Jakke and Helena create the vocal arrangements. Can you give an example of how process unfolds? I’ll first write the instrumental versions of the songs as ready as possible. All the drums, guitar, bass and orchestrations are already in place when Mikko starts to work on the lyrics. After he has listened my demos he kind of visualizes the songs in his head and starts to write the stories on the paper. And when the lyrics are ready, we start to work on the melodies with Helena. I might have some killer melodies in my head which I want to keep, but usually I want her to come up with her own vocal lines. In any case, I keep the strings in my hand and try to think which melodies or rhythms will support the song in the best possible way. With Amain’s release comes promotional tours. Please tell me you will in North America…I will travel to see you. What are the touring plans? Any plans for filming? We have already started planning some EU tours but there is nothing we can confirm at this point… BUT it would be awesome to play on your side of the world as well. You never know what our booking agents can come up with. Fingers crossed! Your native language is Finnish, but you sing in English. Have there been obstacles with this? How have you overcome them? Personally I just like more how English sounds with brutal vocals as Finnish feels quite soft when sung (not the swear words though!). We actually have a special acoustic version in the new album where clean vocals are done in Finnish. Of course English makes the songs and stories more approachable for wider audiences as well but that has never been any deciding factor. I’m definitely no native when it comes to English but I feel I can express the feeling and narratives well enough with it. I’ve read that Helena is adept at singing in several musical styles. How do you see this shaping the future of the band? Where do you see yourselves in….say 3 years? 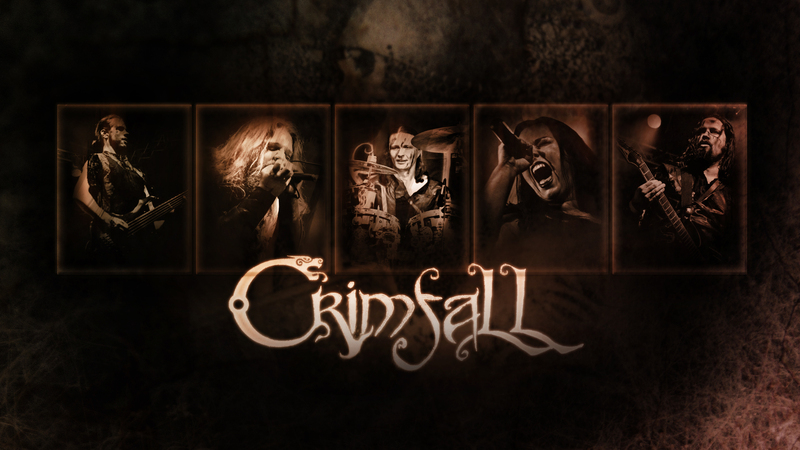 As long as I’m in the band, Crimfall will always adapt different musical genres. The crazier the idea, the more likely it will end up on the album. For me having a singer as chameleon as Helena is, is a gift that I will always take an advantage of. I hope in 3 years more and more people have found our music and with that support we could make our band even bigger (without any compromises regarding our musical style). Now that you’re on Metal Blade, how have things differed? Obviously, there is a difference in production and promoting, but has there been a change in the dynamic in the band? Not just with production and promoting but in dedication and professionalism as well. It feels the seer interest of getting things done right and in time, giving support and demanding also from us more etc. is miles from any of our previous labels. That has required us to step up a notch also, delegating tasks inside the band more actively etc. For example Helena has been taking more responsibilities on social media activities. Aside from the fantastic music scene, is there anything you would like share about Finland? swimming in the lakes with their beers.